For some, it’s a day of service. For others, it’s a day of reflection. For all of us, it’s a day of unity. 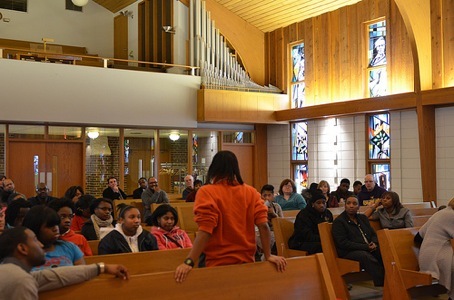 The following stories are examples of organizations and community members in Milwaukee honoring and celebrating the enduring message of Dr. Martin Luther King Jr.
Milwaukeeans celebrated Rev. Dr. Martin Luther King Jr.’s birthday at the Marcus Center for the Performing Arts with cultural performances, student speeches and art projects, and a theatrical look at Milwaukee’s history against discrimination. Admission Possible staff and AmeriCorps members observed the birthday of Dr. Martin Luther King Jr. by participating in a day of service. The volunteers painted a recently renovated home for House of Love Youth Homes, Inc., which provides housing while promoting self-sufficiency and a family environment.